Thanks for another great RARSfest. RARSfest 2019 will be on April 20th. 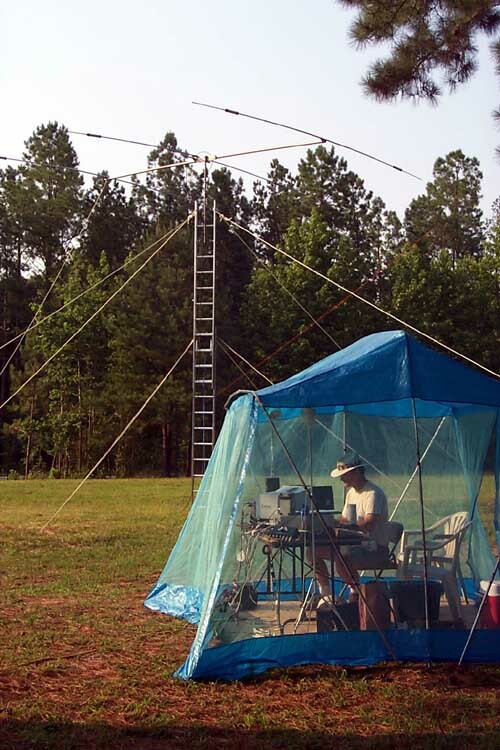 Welcome to the Raleigh Amateur Radio Society (RARS)! Founded in 1969, RARS has grown to become the largest Amateur Radio Club in North Carolina. In 1999, RARS a new RARS was incorporated with 501(c)(3) nonprofit tax status. With over 300 members, RARS reflects a wide variety of interests: ARES and Public Service, HF operation, DX, home-brew, vintage equipment, CW, all modes of VHF/UHF, satellites, packet and computers, ATV, new-Ham training, VE testing, contests, awards, special events, FM and repeaters, Field Day operation, club meetings, shortwave listening/scanning, hamfesting and the Exciter newsletter are all part of RARS member's activities. To find out more about RARS, come to a meeting, ask on a repeater, browse this website, or talk to any member! We're glad you're here! RARS general membership meetings are on the second Tuesday of each month, at the Ridge Road Baptist Church, 2011 Ridge Road, Raleigh, NC 27607. This map should help you find it. If you see lots of cars with antennas all over them, you're in the right place. At 6:00 P.M., before the general membership meeting, there is a "New Ham / Elmer" meeting. 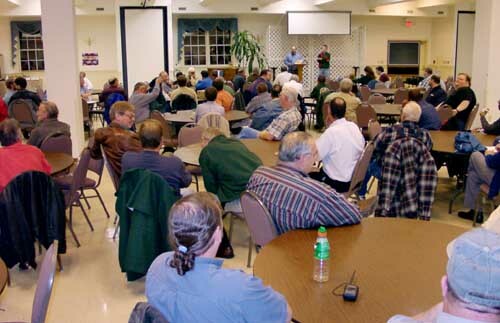 Somewere aroumd 7:00 folks start arriving for a general social gathering followed by the Generl Membership meeting at 7:30 P.M. We begin the meeting by welcoming visitors, then we make a bunch of announcements, and finally we have a program of general interest to Amateurs. We close by drawing names for door prizes. RARS meetings are not bogged down by a lot of business. Club business is handled at the Board of Directors meeting, open to all members on the third Tuesday of each month. If you enjoy the nitty-gritty of club operation, or just have a bone to pick, come be board with us. The March meeting is actually our birthday party. RARS members' efforts are recognized with certificates and plaques. It's one of the major RARS social events of the year. The October meeting is our annual Auction, a golden opportunity to get rid of your junk and/or acquire a "treasure." Ham radio and computer related equipment only, please. The December meeting is our Holiday Party, time to bring the whole family. 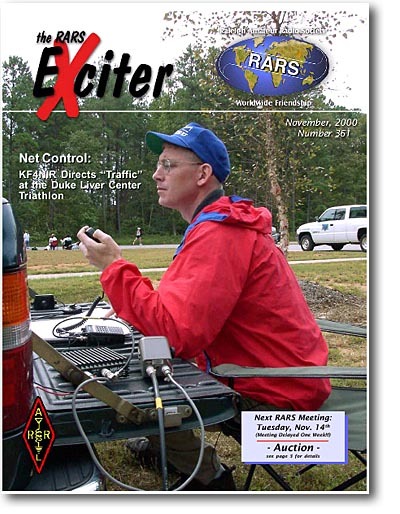 The Exciter is the RARS monthly newsletter, with news and feature articles about RARS, our members, and local Amateur Radio activity. As a RARS member you recceive an email notice each month when the new Exciter issue is available. By simply clicking a link in the email, or by going to the Exciters page on the club web site, you can read the newsletter from the comfort of your home. Members are encouraged to submit articles for the newsletter. Contact the editor for more information. To view the Exciter on your PC you'll need a copy of the free Adobe Acrobat Reader. Click the icon at the right margin to go to Adobe's download page and specify the free Acrobat Reader. The website will offer to download additional free products. If you don't want them just click the check boxes to remove the check-mark before you continue. Note: If you don't have internet access, or for some reason you can't use the online Exciter, the RARS Treasurer will be glad make arrangements to send you a printed copy of the Exciter each month via USPS Snail Mail. Each spring, RARS sponsors RARSfest. 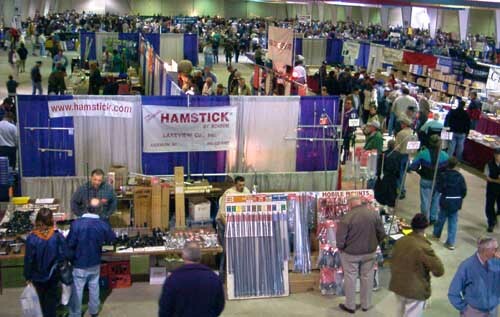 Big enough that we outgrew the Exposition Center and moved to the Jim Graham Building at the NC State Fairgrounds, RARSfest is among the larger hamfests in the Southeast. Dozens of club members volunteer to help with setup, talk-in, tickets, vendor assistance, security, hospitality, exams, the Friday Night Social, and more. Most volunteers work a two-hour shift, leaving plenty of time to check out the flea market and enjoy the event. If you want to dig in deeper, the hamfest committee meets throughout the year, planning and preparing for the event. Contact the Hamfest Chairman. One of the most important aspects of Amateur Radio is Public Service. Whether it involves providing radio operators for a local walking event or for a command post during an emergency, Amateur Radio provides a valuable communications link. RARS members work with hams from all the area clubs to provide communications for more than a dozen charity fund-raisers each year, including a two-day, 150 mile bike-a-thon for the MS Society, the Raleigh Marathon, Triathlons, the Special Olympics and smaller walks and events. In times of disaster, RARS members, along with other Amateurs statewide, man the communications centers under the ARES banner. Wake County is unique in that Raleigh is the State Capitol. Thus, we provide both local communications and state coverage. None of this is possible without RARS members willing to give a small amount of time each year to these events. Public Service activities are not for everyone, but as a new member to RARS, we ask that you volunteer for just one event to try it. If everyone would do this, we would have no problem in providing enough operators for all the events. If you don't enjoy it, fine. But chances are you will find it one of the most rewarding aspects of our hobby. To learn more, contact the RARS Public Service Director, and check out the Public Service Web Page. RARS conducts Amateur Radio License classes several times each year. The RARS Education Director plans classes aimed at the Technician, General, and Extra class license. Several members volunteer to teach class segments in areas of their own special interest. Tne RARS Volunteer Examiners are accredited through the W5YI VEC (Volunteer Examiner Coordinator). They administer exams at several area hamfests including RARSfest, at the end of each RARS licensing class, and other at other locations on occasion. For more information about the classes or exams see the Ham License Class and Exams page, or contact the RARS Education Director. RARS operates an email list server on the internet. Users "subscribe" to the RARS-L mailing list by registering their e-mail address. Then, when any subscriber sends a single e-mail message to the list's address, the server copies the message and sends it out to everyone on the list. There are thousands of mailing lists on the internet - one or more for just about any subject you can think of. The RARS-L is a great way to let area hams know about RARS related activity, or important bulletins on any ham subject. Click here to subscribe to the RARS-L mailing list. Every now and then, there are public events that give us an opportunity to set up an operating station and demonstrate Amateur Radio. For example, in 1992, RARS set up a SAREX network with the Wake County School system, making contact with the Shuttle Endeavour. We operated at the State Capitol for the city's bi-centennal. And we've set up in malls for public demonstrations. If you would like to organize a special event station in the name of RARS, contact an officer or board member. The December meeting is the Holiday Party - a big family event, with lots of food and fun. Sometimes it's catered, and sometimes it's potluck, so check your Exciter or the web page for details. The fourth full weekend in June is the ARRL sponsored Field Day. RARS goes at it big... but we're not so "out to win" that we ignore the newcomers. We usually have a Novice/Tech station, and new hams are invited to sit in on all the other stations and learn how it's done. But even with our open door operating policy, we managed to win 1st place in the 7A class in 1997, coming in 11th nationwide in all classes! We did even better in 1998, winning the 8A class and making the TOP TEN box for all stations nationwide at #8, and winning 8A again in 2000! Contact the Field Day Chairman for more info. As an ARRL Special Service Club, RARS is qualified to have one of its members check QSL cards for some ARRL Awards. Currently, Jeff Wittich AC4ZO can check cards for the ARRL Worked All States (WAS) award and the VHF/UHF Century Club (VUCC) award. You can check the rules and get an application form here on the ARRL web site. Contact Jeff for details on getting your cards checked. The RARS Outgoing QSL Service is a real cost and time saver for the HF DXer. The service works with the ARRL Outgoing QSL service to conveniently send your DX QSL cards overseas to foreign QSL bureaus. To use this service you must be a member of both RARS and the ARRL. There is no charge. Presort your DX QSLs alphabetically by call sign prefix, with the numerical prefixes first (5N, 9D, AP, C8 ,F, G, JA, ZN, etc.). Addresses are not necessary. Attach current month's mailing label from QST, or a photocopy of the label or of your membership card. Secure cards with a rubber band. Drop into QSL box located at the sign-in table at the RARS regular monthly meeting. This service cannot forward cards to US amateurs in the lower 48 states or to those countries which have no operating bureau. You can also reply to foreign SWL stations, or if you go on a DXpedition, we can handle your outgoing US cards with your foreign call shown on the QSL card. Questions? Contact the RARS Secretary. We're looking forward to see who you work. SKYWARN is a public service activity sponsored by the National Weather Service. Amateurs across the country act as weather spotters, reporting to organized nets whenever severe weather threatens a region. In this area, Skywarn operates as part of ARES (Amateur Radio Emergency Service), and uses the 146.88 Repeater. If a watch or warning is issued, listen to .88 and follow the net control station's instructions. SKYWARN has their own web page. Also known as the Tarheel Scanner and Shortwave Listening Group, this popular SIG is for hams and non-hams interested in Shortwave Listening and Scanning. The SIG has made field trips to interesting facilities such as the Voice of America transmitter facitlity, the NC Highway Patrol's Communications Headquarters, and the RDU Airport Control Tower. For more information check the Tar Heel Scanner / SWL SIG Group" on Yahoo Groups. The Sign Man of Baton Rouge - This is a special web site set up for ordering RARS badges online. The Sign Man has also created this color badge using the new RARS logo. It's a little more expensive. You'll find details on their web page. 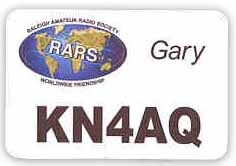 RARS is an Affiliate and Special Service Club of the American Radio Relay League. ARRL is the national organization for all radio amateurs and provides information on all aspects of Amateur Radio in its monthly journal QST. The ARRL is also the main voice for Amateurs to the Federal Government and the FCC, and seeks to preserve our position and frequencies at international conferences. You and RARS both benefit when you join ARRL. Contact the RARS ARRL liaison for league membership applications. Most of RARS members must be ARRL members for RARS to be an ARRL Affiliated Club. RARS recommends you consider joining the League, with or without holding an Amateur Radio license. CNCLAN (N4AJF-2) on 147.54, in Cary. If you can't reach the BBS directly, connect to one of the LAN nodes, then connect to the BBS. The East Wake Communications Association also maintains the equipment that links the Raleigh area to the rest of the state. For more info, contact Ronnie Reams WA4MJF. The Triangle ATV Association ( http://www.qsl.net/tri-atv ) is an independent Amateur Radio Club dedicated to promoting Amateur Radio Fast Scan Television in the Triangle area. RARS has purchased some equipment for use by the ATV group. The Association was founded in January, 1993 and operates a state-of-the-art ATV repeater located on "TV Hill" north of Durham. RARS operates repeaters on 2-Meters, the 220 and 440 MHz bands, and has some others waiting for some TLC to get them back on the air. Our "flagship" machine is 146.64, located near the State Fairgrounds in west Raleigh. Check Local Area Repeatrers for a list of repeaters in the area.